Over the weekend, I spent some time at my local Verizon store and I played around with the Motorola Xoom slate tablet running Android. 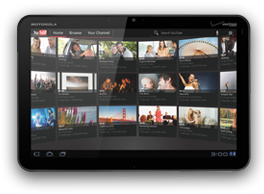 The Xoom is the first slate tablet being powered by Android 3.0 (Honeycomb) and you can upgrade it to 4G LTE (at no cost). I'm still using a Droid X on the 3G network and I also carry an Apple iPad. When I need to get online with my iPad, I simply switch on the 3G Mobile Hotspot feature on my Droid X and I'm able to get online very easily. The Xoom will be one of the first "larger" slate tablets to offer 4G LTE connection speeds, so you can expect blazing Internet speeds on this device. Have you tried the Xoom? If I didn't already have an iPad, I would seriously consider purchasing a Xoom. Then again, maybe I'll need to sell my iPad (or give it away) so that I can justify having a Xoom.